The arrival of sound cinema in Spain (1928) led to the incorporation of elements of national lyrical theatre to the new medium, as well as the adaptation of new styles from the US. Zarzuela adaptations gave way to stylised genres such as comedies with romantic overtones, which shared the stage with folkloric musicals performed by our most well-known folklóricas in flamenco attires. The collaboration of composers with film makers in the 1930s was intermittent and most musicians did not consider cinema as a high form of musical expression. Because of the Spanish civil war (1936–39) directors, actors and composers worked for the Hispano Film Produktion in Germany, thus seeking the internationalisation of our cinema. With the arrival of Francoism after the armed conflict, the new regime revived audio-visual practices from republican times and moulded them to the needs of the political autarky in which the country was plunged. Music in films was an ideological resource of the first order, boosting the dominant ideology in genres such as military (known as crusade cinema), religious films or literary adaptations, but also creating potentially subversive situations in musicals or film noir. Songs became a very popular way of articulating political and cultural situations in the country. In this paper I analyse some of the main musical practices of the 1940s Spanish cinema, the autarkic years, through the analysis of iconic songs of the era and the impact they had on the society of the time. Sound cinema made its appearance in Spain at an untimely moment, coinciding with the years of the Second Republic (1931–1939). The new political situation tended towards liberal modernism and led to the development of a leisure culture to which cinema knew how to cater, despite the serious international economic situation of the time and the undeveloped film policy of the republican government. Sound cinema was received with a degree of scepticism by Spanish audiences, generating a controversy among the intellectual elites of the time, who in some cases were in favour of silent cinema as a pure expression of the new art. Cifesa and Filmófono, the two main production companies during the Second Republic, despite their ideological differences, had more points in common than expected: both produced significant budget films, collaborated in the configuration of a Spanish star system and presented popular themes in their plots, accommodating the folklore of virtually the entire nation (García Carrión 2013a, 194). The two producers collaborated on the emergence of a new genre, the folkloric musical, influenced by the cuplé, the revista and the zarzuela as much as by the American musicals and aesthetic advances of the German and Soviet film industries. The outbreak of the Spanish Civil War (1936–39) was followed by a period of uncertainty. Since producers and studios were not certain about what was going to happen, some ceased their activity. The logistics of the war also caused media professionals to become dispersed throughout and beyond the country. Benito Perojo and Florián Rey, who stood as the most important directors of Spanish cinema at the time, were unable to continue working in Spain and emigrated to Germany in order to continue their professional activity under the Spanish-German Hispanic Film Produktion in Berlin. There they developed some of the most emblematic titles of their careers with their main stars of folkloric musicals. Perojo filmed with Estrellita Castro the adaptation of The Barber of Seville (El barbero de Sevilla, 1938) and the folkloric musicals Sighs of Spain (Suspiros de España, 1938) and Little Bug Earthquake (Mariquilla Terremoto, 1939), while Rey filmed his then muse and wife Imperio Argentina a version of the myth Carmen, from Triana (Carmen, la de Triana, 1938) and The song of Aixa (La canción de Aixa, 1939), which presents the Andalusian world as an appendix to the East. Spanish post-war film music is largely indebted to the compositional stereotypes developed during the Second Republic. Moreover, before an aesthetic break, the regime proposed a break at an ideological level, allowing the audience to identify with the works previous to the civil war and creating a situation of conceptual ambiguity. Many of the resources and functions of music applied during the 1940s were used previously and continued in the decade due partly to the influence of film music practices of classical Hollywood studio era of the 1930-1940s, to which the composers of Spanish cinema had access. They developed a unique style halfway between the influences of foreign composers (mostly American) and their own intuition because, in general, all of them had extensive experience in musical theatre. At this time the influence of Hollywood cinema of the 1930s is apparent at all levels, particularly with reference to musical matters. Film professionals chose to take the same measures as their American colleagues. Amongst those, and without doubt the most important, was to recruit a large group of conservatoire professionals trained in classical composition to create musical soundtracks. Of course there were already composers working in the industry during the Second Republic, but always in discrete collaborations. No academically accredited professional composer would have thought to devote himself exclusively to the creation of music for the cinema. The most important factor for that change was the economic one: the situation in Spain during the war was becoming even tougher and academic activity was not well paid. The film industry became a lucrative means which also allowed social mobility. Juan Quintero, Manuel Parada, Jesús García Leoz, José Ruiz de Azagra, Salvador Ruiz de Luna, José Muñoz Molleda, Joan Duran Alemany and Ramon Ferrés i Mussolas were the most prominent composers in the autarkic period and the first three are considered the main composers of the period. Both Quintero and Parada composed music for a huge number of films (about 250 films per composer), which means constant work in the film industry and almost exclusive dedication. Composers did not hesitate to use some of the codes of musical theatre in their films, which many authors call clichés: clearer descriptive examples are mickeymousing (such as galloping horses, the wind in a storm or the firing of rifles), the over-use of strings in love passages with a clear emotional role, describing places and the characterisation of characters, changes of time, feelings and situations are a constant in this cinema. The technique of leitmotif is recurrent in autarky cinema, as well as the so-called “color local” (local colour), which Lluís i Falcó has defined as “local cultural convergence”; that is, placing the audience in a physical space through musical cues with folkloric roots that the audience associates with a particular region of Spain. In true Hollywood style, but without its means, composers made the cues once filming had finished and, in many cases, they orchestrated the musical numbers and even conducted the orchestra in arduous recording sessions. They used to deliver a pattern of composition, a musical script with scenes, roll number and minutes. In some cases, composers pointed to musical “themes” or “motives” created for the films. The musical cues the composer made for the film were almost always narrative, while the songs were entrusted to experts in song making. Most film composers maintained a close relationship with symphonic and lyrical genres, which meant a constant influence of this compositional style on cinema. They combined their cinematographic aspect with classical theatre adaptations and their contributions to opera and other genres. In any case, their work in cinema demonstrates their ability to adapt to the (then) new medium and talent to manage urgent post-war ideologies. After the Civil War, Jose Diaz Morales was the director (and script writer) in charge of bringing to the screen the first version of the zarzuela The Revoltosa (La Revoltosa, R. Chapí, 1949). Manuel Parada composed the soundtrack, basing it on original narrative cues from the zarzuela on the one hand, especially the duet of the protagonists; on the other hand he included musical numbers and a homemade ballet (based on the original dance in the zarzuela) with intertextualised arrangements from the zarzuela. The film, influenced by the musical, includes several numbers played on screen, most notably the two scenes of the protagonist Mari Pepa (made by maestro Parada), the duo of Mari Pepa and Felipe and the famous guajira “Cuando clava mi moreno”, from Chapí’s original work. Parada makes use of the duo of Mari Pepa and Felipe in a non-diegetic orchestral version on countless occasions, a kind of charming appeal for the audience, who recognise in this music “a sense of longing for one generation and curiosity for another.” Parada uses and over-uses the original score, intertextualising original numbers. Rather than structural issues, the composer proposes this compositional method as an “envelope” to recreate an atmosphere at a time when musical theatre has been overshadowed by cinema as mass entertainment. Leaning on pre-existing music, Parada evokes nostalgia for the recent past and the pride of being Spanish. Mari Pepa is dressed in an apron and she is dusting a mirror when she starts singing her first song. In addition, her clothing includes a wide-sleeved chulapo (Madrilian) dress, covering her up to the neck. However, despite this puritanism in her dress code, there is a connotation of transgression in her loose hair, as well as the neckline of her dress. To soften her attractive and sensual features and her black wavy hair, her clothing retains the white colour, giving a connotation of tenderness to her character and, at the same time, of her strict moral code. The musical number is a Spanish tanguillo in A major. The stanza, repeated 3 times with different lyrics, consists of 16 measures that precede the nonsense refrain “con el tripili-trí / con el tripili-trá” (”with the tripili-trí / with the tripili-tra”). This stanza praises the beauty of the female character and silly rhymes are used concerning her birth mark, the Manzanares River and carnations, while the neighbours whistle and dance to the song. The harmony suggests an easily graspable melody, encouraged by secondary actors on screen. Mari Pepa, meanwhile, waves her hands and turns around the room like a sevillanas dancer from Chamberí. Her second song presents a most evolved vision of the protagonist again with her hair loose, this time with a kiss-curl lopsided at the front, in the style of folkloric musicals from the previous decade. Instead of her chaste white dress she now continues to further evoke the Andalusian world with black dots and flounces in her dress and emphasising the role of her hair. Of course, as a good housewife she still wears an apron that accentuates her hips, and is preparing the food. In this case, Parada opts for a pasodoble in a scene which, again, is out of context. He presents the first verse divided into two sections, the first in a minor (Mari Pepa walks along the kitchen) and, for the second section he proposes a modulation to the major mode (A major, Mari Pepa opens the cupboard and picks up some Spanish chorizo). Mari Pepa repeats the first part of the verse (in a minor) while adding the sausage to the cocido and the modulation to A major underscores the movement out into the yard to hang clothes. This second number of Mari Pepa reflects the passivity of the male character, Felipe, in a situation led by the female protagonist: she is the one who sings both songs (Felipe does not appear as a soloist in any musical number), and only in the first case is he allowed to whistle the chorus from his bedroom. Mari Pepa’s songs may seek to meet the expectations of an audience eager for changes (particularly female audiences), a social situation in which women were destined to be the protagonist only in the private sphere. Still, it should not be overlooked that, whatever suggestions of resistance are offered in this film, the dominant ideology is promoted and standards of conduct are established, concisely alluding to the Sección Femenina (the women’s branch of the Falange political movement in Spain). The fact that Mari Pepa’s two songs are presented within the home, one doing the cleaning and the other one cooking and hanging the clothes, shows the predominant role of the woman with which the bulk of the female audience identified. Mari Pepa’s character (played by Carmen Sevilla) is likely to create some urgency in the female Spanish audience: Mari Pepa is required to establish the link of the female protagonist with the female audience situation, usually condemned to the private sphere, and Carmen Sevilla is needed as a benchmark for the economic and socio-cultural change of the Spanish society, especially the feminine one. Image 1. Mari Pepa sings her first song in La Revoltosa while doing the cleaning at home. The main difference between folkloric musicals and zarzuela adaptations is the superiority and preponderance of the female protagonist, an issue that connects with the great success that the cuplé and the revista had in Spain in the 1930s. Jo Labanyi (2004, 5–6) makes use of the terms “conceptual ambiguity” when referring to the use of folkloric musicals by the Franco regime. Its peak was such that Vazquez Montalbán dedicated his sentimental Crónica sentimental de España (1971) to popular coplas, noting the nostalgia encouraged by those songs several generations later. The reprocessing of folkloric musicals, appropriately adapted to the needs of the new regime, did nothing more than reaffirm the importance of the genre, a new one that had absorbed the main features of Spanish opera, zarzuela, revista and cuplé, and had adapted it to the seventh art with connotations of modernity. Undoubtedly, the folkloric musical of the early Franco period is much less fresh and less modern than 1930s folkloric musicals, but it is equally interesting in regards to its articulation of meanings. Image 2. Close up and general view of Estrellita Castro singing “Suspiros de España”. The frequency of habaneras in Spanish cinema is not something new to 1940s cinema, but it also was present in the cinema of the Second Republic. In “La gitana teñida” (“The dyed Gypsy”), also in Suspiros de España, the main characters made fun in flamenco style of a woman trying to change her dark hair into platinum blonde, so she remains halfway, redheaded, which does little to identify her Spanish origins. On the ocean liner, after nostalgic mourning for the homeland, Caribbean rhythms mixed with a flamenco style suggest the interest of the main characters in America, more specifically Cuba. Sole can then be interested in triumph and glory, only possible in Cuba because of the lack of mobility of the classes in her homeland. Perojo assumes that the social change of Spanish women is possible thanks to music as long as it does happen outside Spain. Moreover, once success is achieved overseas, triumph will accompany the folklórica also back to Spain. not to stay away longer. “Yo te diré” offers a furtive glimpse of the lost colonies, which involves yearning for possession and equally nostalgia for their loss. In the scene, the camera shows a close up of the native girl performing the habanera, accompanied by a Spanish guitar. The song exudes a placidity which enraptures the privates in the tavern. The use of a habanera as Philippine popular music is remarkable, with allusions to the finisecular crisis and to the relationship between the Philippines and Cuba, where this musical genre became important. Thus the public of the time understood that the use of this little piece echoes the musical characteristics of a colonial and exotic Spain, irrespective of where that is. “Yo te diré” is a habanera and not Tagalog music, so that the composer drew upon the myth of the Exotic East and freed it of spatiotemporal ties, achieving an atmosphere of exoticism that pervades the scene and transports the viewer to the imagined and dreamed world of the East Indies. 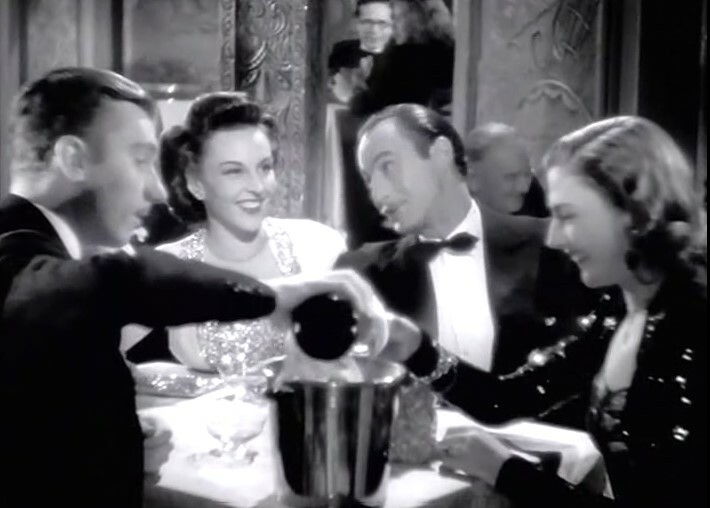 In this scene Tala is the object of desire and the film presents a metropolitan and masculine nostalgia (the soldiers) for the lost colonies (Tala). Image 3. Tala performing “Yo te dire” surrounded by Spanish privates in The Philippines. But not all song genres in 1940s cinema are symbols of Spanishness nor do they all articulate relationships between Spain and Latin America. North American influence is already evident in the stylised Spanish comedies of the 1930s, thanks to cinema made by directors like Perojo and Edgar Neville, who worked in Hollywood before sound cinema arrived at Spain. Characters in these films are elegantly dressed in an “international” and “cosmopolitan” style; they travel overseas, play elite sports and attend elegant evening parties. Moreover, these parties are characterised by foreign rhythms, mostly from the US, played on stage by big swing orchestras that articulate the interest of Spanish audiences for US culture in a time of poverty and famine. Image 4. Characters in El Camino de Babel, drinking champagne and listening to foxtrots. Vale todo, no se callen, digan todo lo que tengan que decir. ¡Hoy no hay novios ni maridos que se puedan enfadar! It’s worth everything, don’t fall silent, say everything that you need to say. Today there are no boyfriends nor husbands who can get angry! It is quite unlikely these lyrics evaded censorship in post-war Spain, especially considering that the relevant authorities forced the modification of this scene. In any event, only within the framework of a comedy can the above situation being approved be explained. Alfredo Mayo, banner of the regime and main protagonist of the film, performed some comedies at this time ridiculing his positioning in previous films, reflected in different scenes of this film. The censors did not ignore this issue and criticised his work, “which has replaced his previous stretch with an excess of mobility that is not precisely the naturalness that art imposes”. Image 5. The singer, before and after singing “Vale todo”. In this article I have tried to review some of the musical practices in Spanish cinema of the 1940s. In any case, these were by no means the only examples available, and habaneras, fox-trots and pasodobles lived together in harmony with other song forms, like schotis (from Madrilian folklore), romantic ballads or boogie-boogies. I have tried to sketch a scene that most of the audience identified with, given that the examples in this paper achieved great success at the time and set the rules for compositional practice. Songs like “Suspiros de España” and “Yo te diré” not only succeeded, but achieved notoriety in other media, especially on the radio, and have been reused over and over again in different contexts, achieving extraordinary longevity. Post-war Spanish cinema is riddled with internal contradictions which show that, despite the prevailing strict censorship, there were also places of subversion, partially articulated by music. In this paper I have explained how a common Spanish identity was articulated, proposed by the Franco regime and promoted in the songs the female characters performed on screen. Similarly, I have left the window open to situations in which music promoted spaces for subversion, especially in American-style comedies, in which swing “jazz rhythms” were deployed to challenge the moral bonds imposed by the Francoist strong doctrine. The examples given are not the only ones, and neither are the song genres unique, but I consider this a significant sample of songs performed on screen that left their mark on the collective memory of the Spanish audience and survived, decade after decade, becoming the standards of an era. La Revoltosa. Director: Jose Díaz Moralez, written by: Carlos Fernández Shaw et al., starring: Carmen Sevilla, Tony Leblanc, Tomás Blanco. Intercontinental Films. 1950. 109 min. Suspiros de España. Director: Benito Perojo, written by: Benito Perojo, Antonio Quintero, starring: Miguel Ligero, Estrellita Castro, Roberto Rey. Hispano Filmproduktion. 1939. 100 min. Los últimos de Filipinas. Director: Antonio Román, written by: Pedro de Juan (screenplay), starring: Armando Calvo, José Nieto, Guillermo Marín. Alhambra-Cea. 1947. 99 min. El camino de Babel. Director: Jerónimo Mihua, written by: Jerónimo Mihua & José Luis Sáenz de Heredia, starring: Alfredo Mayo, Guillermina Grin, Fernando Fernán Gómez. Chapalo Films S.A. 1945. 77 min. Anastasio, Pepa. 2009. “Pisa con garbo: el cuplé como performance.” Trans 13. http://www.sibetrans.com/trans/articulo/61/pisa-con-garbo-el-cuple-como-performance. Arce, J. 1998. Notes for the CD dedicated to composer Juan Quintero. Madrid: Fundación Autor. Arce, J. 2013. “Castanets and White Telephones: (Musical) Comedies During the Early Years of the Franco Regime.” In Music and Francoism, edited by Genma Pérez Zalduondo, and Germán Gan Quesada, 253–264. Washington: Brepols. Casares Rodicio, Emilio (dtor.). 1999-2002. Diccionario de la música española e hispanoamericana, 10 tomos. Madrid: SGAE, INAEM, ICCMU. Everett, William A., and Paul R. Laird. 2009. The Cambridge companion to the musical. Cambridge: Cambridge University Press. García Carrión, Marta. 2013a. “El pueblo español en el lienzo de plata: nación y región en el cine de la II República.” Hispania LXXIII, 243 (2013): 193–222. DOI: http://dx.doi.org/10.3989/hispania.2013.007. García Carrión, Marta. 2013b. Por un cine patrio. Cultura cinematográfica y nacionalismo español (1926–1936). University of Valencia, Valencia. Gubern, Román, and Dominich Font. 1976. Un cine para el cadalso. 40 años de censura cinematográfica en España. Barcelona: Euros. Gubern, Román. 1977. El cine sonoro en la República (1929–1936). Historia del cine español. Barcelona: Lumen, 1977. Labanyi, Jo. 1997. “Race, gender and the disavowal in Spanish cinema of the early franco period: the missionary film and the folkloric musical.” Screen 38 (3), 215–31. Labanyi, Jo. 2004. “Costume, identity and spectator pleasure in historical films of the early Franco period”. In Gender and Spanish cinema, edited by Steven Marsh, and Parvati Nair, 33–52. Oxford and New York: Berg. Lluís i Falcó, Josep. 2001. “Los compositores de la Generación de la República y su relación con el cine.” In Campos interdisciplinares de la musicología (vol. II), edited by Begoña Lolo, 771–784. Madrid: Sociedad Española de Musicología. Martín Gaite, Carmen. 1987. Usos amorosos de la posguerra española. Barcelona: Anagrama. Miranda González, Laura. 2007. “El compositor Manuel Parada y el cine patriótico de autarquía: de Raza a Los últimos de Filipinas.” Cuadernos de Música Iberoamericana 14, 195–227. Miranda, Laura. 2010. “Cine de cruzada en España: creación musical cinematográfica para un Imperio.” In Creación musical, cultura popular y construcción nacional en la España contemporánea, edited by Celsa Alonso et al., 143–167. Madrid: ICCMU. Miranda, Laura. 2015. “Spanish film music in the autarkic period: Comedy, subversion and harmful rhythms in the works of Manuel Parada.” In Sounding Funny. Sound and Comedy Cinema, edited by Mark Evans, and Philip Hayward, 178–195. Sheffield: Equinox. Monterde, J. E. 2009. “El cine de autarquía (1939–1950).” In Historia del cine español (6th edition), edited by Román Gubern et al., 181–238. Madrid: Cátedra. Muñoz Aunión, Marta. 2009. “El cine español según Goebbels: apuntes sobre la versión alemana de Carmen, la de Triana.” In El espíritu del caos. Representación y recepción de las imágenes durante el franquismo, edited by Laura Gómez Vaquero, and Daniel Sánchez Salas, 21–62. Madrid: Ocho y medio. Mensenguer, Manuel Nicolás. 2004. La intervención velada: el apoyo cinematográfico alemán al bando franquista, 1936–1939. Murcia: Universidad de Murcia. Otero, Luis. 2004. La Sección Femenina. Madrid: Edaf. Salaün, Serge. 1990. El cuplé (1900–1936). Madrid: Espasa Calpe. Salaün, Serge. 2011. Les spectacles en Spagne (1875–1936). París: Presses Sorbonne Nouvelle. Triana-Toribio, Núria. 2003. Spanish national cinema. London and New York: Routledge. Vázquez Montalbán, Manuel. 1971. Crónica sentimental de España. Barcelona: Lumen. Woods, Eva. 2012. White Gypsies. Race and stardom in Spanish Musicals. Minneapolis and London: University of Minnesota Press. Yraola, Aitor. 1999. “‘Misión españolista’: los camaradas Florián e Imperio con Hitler y el Dr. Goebbels.” Film-Historia 3 (1999). http://www.publicacions.ub.es/bibliotecadigital/cinema/filmhistoria/art.yraola.pdf. The researcher Román Gubern describes as “traumatic” the transition from silent to sound cinema in Spain. See, among others, Gubern 1993, 3–24. The zarzuela is a musical genre originated in Spain that is distinguished mainly by including instrumental parts, vocal parts (solos, duos, choruses …) and spoken parts, although there are exceptions in which the latter spoken parts are completely absent. The cuplé is a popular musical style, sometimes rude and spicy. From a scenic point of view, the cuplé is a novelty, but it is not from the musical point of view, linked to two very old Spanish cultural currents: the theater and the popular song. With the advance of time cuplés began to go out of fashion, and other forms of variety show were born, such as the revista, which will triumph from the1930s onwards. On the relationship between Rey and Empire and the Franco regime during their stay in Germany, see further Yraola 1999; Mensenguer 2004; Muñoz Aunión 2009, 21–62. On cinema censorship during the Franco dictatorship, see the essential Gubern & Font 1976. In this regard, see notes by Julio Arce in the CD dedicated to Juan Quintero, 7. In relation to the question of conceptual ambiguity, see Labanyi 1997. On these questions, see PhD (unpublished) researchs by Joaquín López González (University of Granada) on the composer Juan Quintero or by Laura Miranda (University of Oviedo) about Manuel Parada. Unfortunately, few of them have been the subject of any research and many of them do not even appear in the Spanish and Latin America Music Dictionary. See Casares Rodicio (dtor.) 1999–2002. Josep Lluis i Falcó, “Los compositores de la Generación de la República y su relación con el cine.” I prefer this term than others in film music theory, such as Tagg’s ‘sign typologies’, due to its Spanish origins. Definition of Manuel Parada himself in his musical scripts. Composers do not use terms like leitmotiv or “melody”. These compositional questions are extracted from my own research on Manuel Parada and his work on the film industry, but he was not alone in this position and most of his colleagues followed similar working methods. Carmen Martín Gaite, Usos amorosos de la posguerra española (Barcelona: Anagrama, 1987), 34. My translation in this and next texts along throughout the paper. On the evolution of these gender issues and significant works, see further Everett & Laird 2009. The first section of this paper highlights adjustments and transformations of the genre before 1940; Katherine K. Preston (among others) summarises the characteristics of the American musical before the twentieth century. Report of the provincial delegation of Valladolid, April 18, 1950. Archivo General de la Administración AGA (36/04713). Tanguillo is a flamenco singing that admits any metric and apolymetric refrain. It is the result of a process of approach to flamenco tango and its rhythm is very alive. Sevillanas are typical singing and dances of Seville, Huelva and other provinces of Andalusia, which are sung and danced especially in the Feria de Abril in Seville or during the pilgrimage to El Rocío (Huelva). I have consulted the interesting chart compilation about women in the Franco framework made by Luis Otero, La Sección Femenina (Madrid: Edaf, 2004). See, among others: Serge Salaün 1990 and 2011; Anastasio 2009. For an discussion of folkloric musicals see, among others, Gubern 1977; Triana-Toribio 2003; Woods 2012; García Carrión 2013b. Pasodoble is a light march used in military parades. The music that accompanies this march possesses binary tempo and was firstly introduced in bullfights before becoming a typical Spanish popular dance. To investigate the importance of the habanera in postwar nostalgic crusade film Los últimos de Filipinas (1945), see Miranda 2010, 162–163. Halpern’s authorship of the habanera has been questioned. See Miranda González 2007, 221. To delve further into the study of Spanish comedy in the autarkic period, see Arce 2013, 253–264; Miranda 2015. Provincial Delegate from Jaén, June 14, 1947. AGA (36/04665). My cursive translation.